Olfactory ensheathing cells (OECs) are neural crest cells which allow growth of the primary olfactory neurons. This specific property can be used for cellular transplantation. We present here a model of cellular transplantation based on the use of OECs in a laryngeal nerve injury model. Guerout, N., Paviot, A., Bon-Mardion, N., Honoré, A., OBongo, R., Duclos, C., Marie, J. P. Transplantation of Olfactory Ensheathing Cells to Evaluate Functional Recovery after Peripheral Nerve Injury. J. Vis. Exp. (84), e50590, doi:10.3791/50590 (2014). Olfactory ensheathing cells (OECs) are neural crest cells which allow growth and regrowth of the primary olfactory neurons. Indeed, the primary olfactory system is characterized by its ability to give rise to new neurons even in adult animals. This particular ability is partly due to the presence of OECs which create a favorable microenvironment for neurogenesis. This property of OECs has been used for cellular transplantation such as in spinal cord injury models. Although the peripheral nervous system has a greater capacity to regenerate after nerve injury than the central nervous system, complete sections induce misrouting during axonal regrowth in particular after facial of laryngeal nerve transection. Specifically, full sectioning of the recurrent laryngeal nerve (RLN) induces aberrant axonal regrowth resulting in synkinesis of the vocal cords. In this specific model, we showed that OECs transplantation efficiently increases axonal regrowth. OECs are constituted of several subpopulations present in both the olfactory mucosa (OM-OECs) and the olfactory bulbs (OB-OECs). We present here a model of cellular transplantation based on the use of these different subpopulations of OECs in a RLN injury model. Using this paradigm, primary cultures of OB-OECs and OM-OECs were transplanted in Matrigel after section and anastomosis of the RLN. Two months after surgery, we evaluated transplanted animals by complementary analyses based on videolaryngoscopy, electromyography (EMG), and histological studies. First, videolaryngoscopy allowed us to evaluate laryngeal functions, in particular muscular cocontractions phenomena. Then, EMG analyses demonstrated richness and synchronization of muscular activities. Finally, histological studies based on toluidine blue staining allowed the quantification of the number and profile of myelinated fibers. All together, we describe here how to isolate, culture, identify and transplant OECs from OM and OB after RLN section-anastomosis and how to evaluate and analyze the efficiency of these transplanted cells on axonal regrowth and laryngeal functions. The primary olfactory system is composed of two distinct parts; the olfactory mucosa (OM) in peripheral nervous system and the olfactory bulb (OB) in the central nervous system. The primary olfactory system is characterized by the capacity of the primary olfactory neurons (PON) to self-renew throughout life in mammal species. This ability is made possible due to the presence of neural stem cells in the OM. PON growth and regrowth from OM to OB is facilitated by specialized glial cells called olfactory ensheathing cells (OECs). OECs are neural crest cells which create a favorable microenvironment for neurogenesis of the PON from OM to OB1. Thereby, OECs can be found in OM and in OB constituting different subpopulations of cells2,3. The different properties of OECs have lead scientists to use them for cellular transplantations in several nervous system lesion paradigms4. Indeed, OECs produce growth factors, reduce glial scaring, promote axonal regrowth, and can freely intermingle with astrocytes5,6. However, the vast majority of these studies are based on spinal cord injury (SCI); few of them have used OECs after peripheral nerve injury (PNI)7,8. Although the peripheral nervous system has a great capacity to regenerate after nerve injury, complete sections induce aberrant axonal regrowth. Indeed, after complete transections of the facial or the recurrent laryngeal nerves (RLN) misrouted axons cause muscular cocontractions called synkinesis. Therefore it is of primary importance to propose a model of PNI to not only quantify axonal regrowth but also to evaluate the efficiency of the muscular contractions. In the literature the most common model described is based on facial nerve lesion9,10. In this model, functional evaluations are based on the recovery of whisker movements10. However it is complicated to demonstrate the efficiency of the movements and to discriminate the muscular cocontractions phenomena. We propose here a model based on a RLN lesion. This model allows the evaluation of not only axonal regrowth and movements of the vocal cords but also the efficiency and functionality of these movements after cellular transplantations11,12. This protocol provides a step by step procedure to culture and transplant OECs from OM and OB in an RLN section/anastomosis model and to evaluate animals after surgery. Make medium, for 50 ml, by adding 44 ml of calcium-free Dulbecco's Modified Eagle's/Ham's F12 medium (DMEM/F12), supplemented with 5 ml of Fetal Bovine Serum (FBS) and 1 ml of penicillin/streptomycin. Coat 75 cm2 flasks with poly-L-lysine (50 μg/ml, 1.5 μg/cm2), 1 hr at room temperature. Rinse flasks with PBS 1x. Store the coated flasks in the fridge for up to 1 week. Any method of euthanasia must be approved in advance by the institution's animal care and use committee and carried out by qualified personnel. Choose inbred rats such as Fischer rats. After the rat has been confirmed to have entered deep anesthesia with sodium pentobarbital or other injectable forms of anesthesia such as ketamine/xylazine, decapitate him and remove the skin. Open the skull from the anterior to the posterior part. Remove the OB taking care to avoid the meninges. In the same rat, open the nasal cavity sagittaly. Remove the OM taking care to avoid the respiratory mucosa. Note that the OM epithelium can be easily identified by its yellowish color. Further detailed protocols about dissection of OM can be find in a previous J. Vis. Exp. publication13. Place OB in Hank's buffered salt solution (HBSS) containing 0.1% trypsin for 45 min at 37 °C. Place OM in HBSS containing 0.05% collagenase A for 45 min at 37 °C. Stop enzymatic digestion by adding 2 ml of warm medium. Wash the cells with medium and centrifuge them at 300 x g for 3 min. Triturate samples of 2 ml of medium using a P1000 pipette until a homogenous cell suspension is obtained. Plate the cells in the precoated flasks (5-10 x 106 cells/flask) with 25 ml of warm medium. Incubate and culture the cells at 37 °C with 5% CO2. Change half of the medium every 2 days. After 6-8 days in vitro, check the proportion of p75 positive cells on small cell samples, assumed to be OECs in rodents, by flow cytometry or by immunocytochemistry. For these analyses, other markers can be studied such as GFAP and S100β. Collect the cells as described in "cellular transplantation" (section 2.2 below). Incubate them with p75 primary antibody (1:100) during 15 min at 4 °C. Wash the cells with 2 ml of PBS-EDTA and centrifuge them at 300 x g for 3 min. Incubate the cells with PE conjugated anti-mouse secondary antibody during 15 min at 4 °C in the dark (1:200). Resuspend the cells in 500 μl of PBS-EDTA. Analyze 10-30 x 103 cells with flow-cytometer. Plate the cells in 6-well plates precoated for 48 hr as described in "culture" (section 1.1.2 below). Fix the cells with PFA 4% for 15 min at RT. Incubate the cells with PBS/Triton X100 (0.1%) for 15 min at RT. Incubate the cells with primary antibodies (1:200): p75, S100β and GFAP overnight at 4 °C. Incubate the cells with the secondary antibodies (1:500) during 1 hr at RT in darkness. Incubate the cells with Hoechst 10 min at RT in darkness. Analyze the cells using a fluorescent microscope. Five days before transplantation, infect OB and OM cultures overnight with lentiviral vector harboring enhanced GFP (multiplicity of infection: 20). Before transplantation check on small samples the rate of GFP positive cells by flow-cytometry as described previously in "culture" (section 1.1). All experiments with animals must be approved in advance by the institution's animal care and use committee and carried out by qualified personnel. Prior to surgery autoclave all instruments and maintain sterility throughout the surgical procedures. Anesthetize rat by intraperitoneal injection of ketamine hydrochloride (12.5 mg/kg) and chlorpromazine hydrochloride (0.625 mg/kg). Assess adequacy of anesthesia by toe pinch prior to surgery. Place the rat in dorsal decubitus. Perform a 2 cm vertical medium cervical cutaneous incision with a scalpel. Perform a vertical incision of the infrahyoid muscles following the medial white line. Expose larynx by using autostatic retractor between infrahyoid muscles. Under microscopic control, cut the nerve fully with microscissors at the level of the seventh tracheal ring. Perform anastomosis using one point of 11.0 suture under microscopic control. This surgery leads to a specific motor denervation of the larynx. Just before transplantation, remove the cells from the dishes using 0.05% trypsin EDTA for 5 min at 37 °C. Centrifuge at 300 x g for 3 min. Under a microscope count the cells using a hemocytometer and adjust the cellular concentration according to specific protocol. In this model, desired concentrations were between 1.2-6 x 106 cells in 30 μl of DMEM/F12. Make cellular preparation with 1:2 mix (30 and 60 μl in this experiment) of DMEM/F12-Matrige l in 1.5 ml tube before grafting and place it on ice. To avoid unspecific effects, use growth factor reduced Matrigel. Just prior to transplantation hold the tube in your hand for a few seconds to warm up the Matrigel-medium mix. Depose the mix on the anastomosis site using a pipette and wait until the mixture self-assembles on the injured nerve. Close the muscles and skin with a 4.0 suture. House the rats individually and keep under a heating lamp for 24 hr. Anesthetize rats by intraperitoneal injection of ketamine hydrochloride (12.5 mg/kg) and chlorpromazine hydrochloride (0.625 mg/kg). Confirm rats are anesthetized with a toe pinch prior to proceeding with protocol. Insert a 30° videolaryngoscope adjusted to provide the best view of the larynx. Determine anatomic landmarks to reproduce the same view for each recording. Record vocal cord movements using the videolaryngoscope (5-10 sequences/animal). For each animal select three sequences of successive maximal adduction and maximal abduction. Analyze laryngeal function using image analysis software. Determine absolute angular movement by measuring the difference between movement of maximal abduction and maximal adduction of the vocal cords. Determine dynamic score by measuring the movement amplitude. Determine functional score by measuring the synkinesis and paradoxal movements. Place an electrode on the hamstring muscles of the rat for electrical isolation. Expose larynx and trachea by opening skin and muscles as described previously in "recurrent nerve anastomosis" (section 2.1). Open the cricothyroid cartilage to expose the posterior cricoarytenoid (PCA) muscle using microscissors. Introduce a monopolar needle electrode (38 x 0.45 mm) in the PCA muscle. Record the electrical muscular activity of the PCA muscle using an acquisition system during spontaneous ventilation. Analyze the muscular activity in terms of richness and synchronization with the respiration. To analyze EMGs, assign a qualitative score from 0-3 using the following scale: 0: unrhymed tracing, without increase during inspiration, 1: rhymed tracing with inspiratory increasing, but poor tracing (neurogen), 2: rhymed tracing with richer activity, 3: rhymed tracing, very rich, constituting an interference pattern, similar to a maximal intentional activity. Expose the vagus nerve to measure latency and potential duration. The vagus nerve is chosen as the site of stimulation because RLN can be damaged during stimulation due to its small size. Stimulate the vagus nerve with an electrode. Record electrical signals in the PCA muscle. Measure latency and potential duration. If possible use an acquisition module to record muscular activity, latency and potential duration such as Powerlab system. Euthanize the animal using pentobarbital overdose. Remove the distal stump of RLN under microscopic control. The distal part of RLN is defined as the part between anastomosis and larynx. Note that it is possible to find the anastomosis site several weeks after surgery because the 11.0 suture is a nonabsorbable suture. Place the distal portion of RLN in 2% glutaraldehyde with 0.1 M phosphate (pH=7.3) for 2 hr at 4 °C. Carefully orient the samples to realize coronal sections. Wash samples in phosphate buffer. Cut in smaller segments (3-4 mm length) and postfix for 60 min at room temperature in 1% cacodylate buffered OsO4 and dehydrated with ethanol. Orient samples in silicone molds and embedded in resins consisting in POLYBED 812, DDSA and MNA, to which was added 2% of the accelerator BDMA. Make semi-thin transverse sections (1μm-thick) using a Pyramitome Ultramicrotomy System. Stain with 0.1% Toluidine Blue in 1% sodium tetraborate for 75 sec at 70 °C. Analyze RLN samples with a counting analysis system. Count the number of fibers and measure myelinated nerve fiber profiles by determining the outer and inner boundary of the myelin sheath. Prepare cells for transplantation and transplant the cells as previously described in "cellular transplantation" (section 2.2). Euthanize the animal using pentobarbital overdose. Note that fixation of the animals can be performed using intracardiac injection of PFA 4%. Remove around 2 cm of RLN. Use proximal and distal parts of the RLN. Fix RLN sample in liquid nitrogen. Store samples at -80 °C. Cut samples longitudinally using cryostat (10-20 μm thick). Analyze samples under fluorescent microscope to detect GFP positive cells. Note that anti-GFP antibody can be used to increase fluorescence emission and to perform costainings. Illustrations with control and reinnervated (section/anastomosed) animals have been chosen as results can vary depending on the cellular transplantations performed (OM, OB or OM+OB). The cells adhere rapidly to the plastic surface and became segregated into parallel swaths of cells that are elongated or tapering, triangular, multipolar, or spindle-shaped (Figures 1A and 1B). After 8 days in vitro flow cytometry analysis shows the rate of p75 positive cells, 71% in primary OB, and 13% in primary OM cultures (Figures 1C and 1D). The cells are transplanted in a Matrigel-medium mix on anastomosed RLN. Anastomosis of the RLN is made by one point of 11.0 suture (Figure 2). Videolaryngoscopy Two months after transplantation, laryngeal functions were analyzed by videolaryngoscopy and electromyography. To realize videolaryngoscopy anatomical landmarks were chosen to measure difference between abduction and adduction (Figure 3). To complete these analyses EMG studies were performed using monopolar needle electrode implanted in the PCA muscles. Typical traces for normal and reinnervated (section/anastomosed) animals are presented in Figure 4. For these animals, histological analyses of the RLN were performed by toluidine blue staining. Typical fiber profiles for normal and reinnervated (section/anastomosed) animals are presented in Figures 5A and 5B. To complete these histological analyses, tracking of GFP positive cells was performed. Figure 5C illustrates the presence of GFP positive cells into the sciatic nerve after intra-nervous transplantation. Sciatic nerve has been used as control as the RLN size does not allow intra-nervous transplantation. Figure 1. Morphological properties and P75 expression in primary cultures of OB (A and C) and OM (B and D) in vitro. (A and B) OECs in OB and OM primary cultures expressed elongated, triangular, or spindle-shaped morphologies. (C and D) Cell surface expression of p75 in OB and OM primary cultures was determined by flow cytometry. Numbers indicate the total population and the percentage of cells present in the indicated gated regions. Please click here to view a larger version of this figure. Please click here to view a larger version of this figure. Figure 2. Picture of an anastomosis of the RLN performed with 11.0 suture. (A) Sectioned RLN before surgery. (B) Anastomosis between the proximal and the distal stump of the RLN. Please click here to view a larger version of this figure. Figure 3. Typical endoscopic views of the rat glottis plan. During evaluations, landmarks are determined in order to have the same field of view for each recording. From the presented view both the maximal abduction (A) and the maximal adduction (B) are measured. Please click here to view a larger version of this figure. Figure 4. Examples of EMG traces obtained during respiration in the PCA muscle. (A) Animals of the control group presented a rich electrical muscular activity, with an increase during inspiration. (B) EMG traces showed that the reinnervated (section/anastomosed) group left this synchronized activity. Please click here to view a larger version of this figure. Please click here to view a larger version of this figure. Figure 5. Histological nervous studies. (A and B) Example of coronal sections of the RLN from control group. This analysis showed that the control group presented a higher number of myelinated fibers. (A) Magnification 3,960X and (B) magnification 11,900X. (C) GFP labeled OB-OECs remained at the lesion site into crushed rat’s sciatic nerve. Magnification 100X. 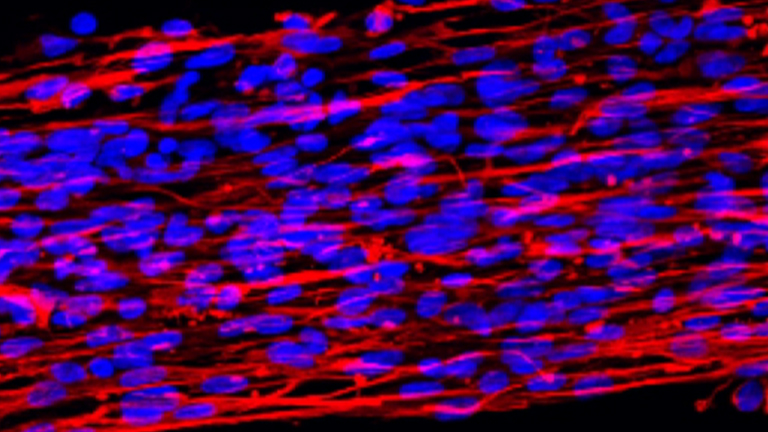 The techniques presented here make OECs a useful model to study cellular transplantations in peripheral nerve injury models. The cell culture protocol is relatively straightforward and can be easily carried out. On the other hand, surgical procedures, in particular section/anastomosis of the RLN, require experience and must be carried out by qualified personnel. The procedures described in this protocol highlight important factors to focus on in order to obtain the best results possible. First, during dissociation of OM, we recommend careful dissection to obtain only olfactory and not respiratory epithelium. Second, for the anastomosis of the RLN, we recommend to performing only one point with an 11.0 suture. Third, during evaluations it is very important to have the same depth of anesthesia between all animals. In particular, deep anesthesia reduces the amplitude of movement of the vocal cords during videolaryngoscopy. We recommend removing the laryngoscope as soon as possible to avoid asphyxia of the animals. During EMG recording, due to the size of the PCA muscles we recommend carefully placing the monopolar needle electrode. Finally, for histological studies it is important to carefully orient the RLN samples to obtain coronal sections. It is also very important to remove and analyze the distal part of the RLN in which Wallerian degeneration occurs. The protocols described here can be easily modified in order to generate purified cultures of OECs from OB and OM. For purification of OECs from OB we recommend the technique described by Nash14 and for the purification of OECs from OM we recommend the method described by Bianco15. These two specific purification methods allow to have highly purified cultures of OECs (90%) and have been previously well described by their authors14,15. Another possible modification is the transplantation procedure where the cells can be injected directly into a peripheral nerve as described previously for the sciatic nerve7. In this case the cells can be injected without Matrigel. It is important to note that due to the size of the RLN it is not possible to inject cells directly into this nerve. Finally another possible modification is optimization of the EMG protocol. Indeed, muscular activity recordings of the PCA and diaphragm muscles can be performed together, eliminating the need for synchronization between laryngeal and respiratory muscles. The current protocols can be applied in other nervous lesion paradigms. We have already transplanted OECs in several models of PNI such as sciatic and vagus nerves, these therapies can be easily used in other PNI paradigms8,11,12,16. More interestingly cellular transplantation of OECs can be extended to central nervous system diseases in particular SCI. The method described here for measurement of laryngeal function after RLN section/anastomosis can also be used for other cellular transplantations protocols. Indeed, laryngeal models can be very powerful to evaluate axonal regrowth and synkinesis phenomena. The authors would like to acknowledge ADIR (Aide à Domicile aux Insuffisants Respiratoires) and Fondation de l’Avenir for their financial support and to Dr. Fanie Barnabé-Heider for editing the manuscript. Barraud, P., et al. Neural crest origin of olfactory ensheathing glia. Proc. Natl. Acad. Sci. U.S.A. 107, 21040-21045 (2010). Guerout, N., et al. Comparative gene expression profiling of olfactory ensheathing cells from olfactory bulb and olfactory mucosa. Glia. 58, 1570-1580 (1002). Honore, A., et al. Isolation, characterization, and genetic profiling of subpopulations of olfactory ensheathing cells from the olfactory bulb. Glia. 60, 404-413 (2012). Franssen, E. H., de Bree, F. M., Verhaagen, J. Olfactory ensheathing glia: their contribution to primary olfactory nervous system regeneration and their regenerative potential following transplantation into the injured spinal cord. Brain Res. Rev. 56, 236-258 (2007). Lakatos, A., Franklin, R. J., Barnett, S. C. Olfactory ensheathing cells and Schwann cells differ in their in vitro interactions with astrocytes. Glia. 32, 214-225 (2000). Woodhall, E., West, A. K., Chuah, M. I. Cultured olfactory ensheathing cells express nerve growth factor, brain-derived neurotrophic factor, glia cell line-derived neurotrophic factor and their receptors. Brain Res. Mol. Brain Res. 88, 203-213 (2001). Dombrowski, M. A., Sasaki, M., Lankford, K. L., Kocsis, J. D., Radtke, C. Myelination and nodal formation of regenerated peripheral nerve fibers following transplantation of acutely prepared olfactory ensheathing cells. Brain Res. 1125, 1-8 (2006). Guerout, N., et al. Transplantation of olfactory ensheathing cells promotes axonal regeneration and functional recovery of peripheral nerve lesion in rats. Muscle Nerve. 43, 543-551 (2011). Guntinas-Lichius, O., et al. Transplantation of olfactory ensheathing cells stimulates the collateral sprouting from axotomized adult rat facial motoneurons. Exp. Neurol. 172, 70-80 (2001). Makoukji, J., et al. Lithium enhances remyelination of peripheral nerves. Proc. Natl. Acad. Sci U.S.A. 109, 3973-3978 (2012). Guerout, N., et al. Co-transplantation of olfactory ensheathing cells from mucosa and bulb origin enhances functional recovery after peripheral nerve lesion. PloS one. 6, 22816 (2011). Paviot, A., et al. Efficiency of laryngeal motor nerve repair is greater with bulbar than with mucosal olfactory ensheathing cells. Neurobiol. Dis. 41, 688-694 (2011). Girard, S. D., et al. Isolating nasal olfactory stem cells from rodents or humans. J. Vis. Exp. (2011). Nash, H. H., Borke, R. C., Anders, J. J. New method of purification for establishing primary cultures of ensheathing cells from the adult olfactory bulb. Glia. 34, 81-87 (2001). Bianco, J. I., Perry, C., Harkin, D. G., Mackay-Sim, A., Feron, F. Neurotrophin 3 promotes purification and proliferation of olfactory ensheathing cells from human nose. Glia. 45, 111-123 (2004). Paviot, A., Bon-Mardion, N., Duclos, C., Marie, J. P., Guerout, N. Although olfactory ensheathing cells have remarkable potential to sustain nerve regeneration, they cannot be applied to a severe vagus nerve section/resection model. Muscle Nerve. 43, 919-920 (2011).